Tag line: "A Science Fiction Fantasy"
Thus begins 2005’s The Wild Blue Yonder, a science fiction fantasy that could only spring from the mind of Werner Herzog. An alien (Brad Dourif) from another galaxy, who has been on earth for some time, guides us through a most unusual story. After relating the tale of how his people came to this planet, the Alien tells us about a dangerous situation that occurred several years earlier, when a group of scientists decided to examine the spaceship that landed in Roswell back in the 1950s. During their investigation, some members of the research team contracted an unknown virus. Fearing a widespread epidemic that might destroy life on earth, the CIA, in association with NASA, sent a group of astronauts into deep space, hoping they would find another planet that, in an emergency, could support human life. Using a series of chaotic tunnels located in our solar system, the astronauts eventually made their way to what had been the Alien’s home world, a beautiful place nicknamed “The Wild Blue Yonder”, and what they found there would both shock and amaze them. 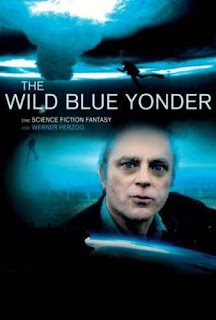 In unison with the scenes featuring Brad Dourif’s Alien (in one, he pays a visit to n abandoned town that his people built years earlier, a place they hoped would become their capital city on earth), The Wild Blue Yonder relies on stock footage (some of which was provided by NASA), which is strategically pieced together to tell a fictional tale of otherworldly visitors and deep space travel (training exercises for new astronauts, filmed at the Johnson Space Center, are presented here as images of the Alien’s people arriving on earth). At times, the visuals are amazing (especially towards the end, when shots of Henry Kaiser’s underwater expedition in Antarctica stand in for the supposed “exploration” of the Alien’s home world), but its Brad Dourif’s bizarre narration that makes The Wild Blue Yonder so much fun to watch (a sequence in which he attempts to explain the complexities of space travel while standing in front a decaying trailer park is a definite highlight). While the stock footage does occasionally wear out its welcome (there are too many scenes of astronauts floating weightless in space), Brad Dourif never does. Simultaneously strange and fascinating, his performance is the glue that holds The Wild Blue Yonder together, and while I definitely recommend the movie as-is, I can’t help but wish that Dourif appeared in it a bit more often than he does.